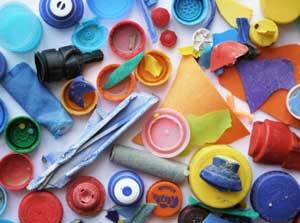 (Nanowerk News) From campaigns against microplastics to news of the great Pacific garbage patch, public awareness is growing about the outsized effect plastic has on the world’s oceans. However, its effect on the air is far less obvious. Plastic production, use, and disposal all emit prodigious amounts of greenhouse gasses, but scientists haven’t had a firm grasp on the scope. Now researchers at UC Santa Barbara have determined the extent to which plastic contributes to climate change, and what it would take to curb these emissions. The results appear in the journal Nature Climate Change ("Strategies to reduce the global carbon footprint of plastics"). Researchers conduct first global assessment of the lifecycle of greenhouse gas emissions from plastics. Plastics have surprisingly carbon-intense life cycles. The overwhelming majority of plastic resins come from petroleum, which requires extraction and distillation. Then the resins are formed into products and transported to market. All of these processes emit greenhouse gases, either directly or via the energy required to accomplish them. And the carbon footprint of plastics continues even after we’ve disposed of them. Dumping, incinerating, recycling and composting (for certain plastics) all release carbon dioxide. All told, the emissions from plastics in 2015 were equivalent to nearly 1.8 billion metric tons of CO2.